There may not be money in the United Federation of Planets, but there’s now legal Star Trek currency in Canada, courtesy of the Royal Canadian Mint. Although some of these financial arrangements sound like they were made by a Ferengi. Via The Trek Collective, the Canadian Mint has announced its plans to celebrate the 50th anniversary of Star Trek by releasing a line of coins that can actually be used in financial transactions…if you were so inclined. Some of them are even reasonably priced. The $10 colored coins featuring Kirk, Spock, Uhura, and Scotty are only being sold for slightly over the face value, while the $20 silver coins featuring the Enterprise are being sold at face value. Here’s where it gets dicey. The colored silver coins with the Enterprise are going for over $100 in Canadian dollars, even though it only has $20 in face value. But that pales in comparison to the pure gold Star Trek Delta Coin, which is based on the Starfleet insignia worn by the crew on the original series. 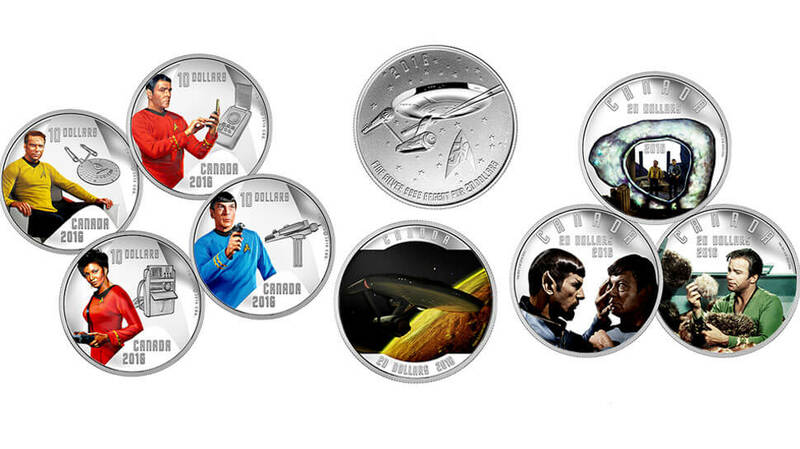 You can find the rest of the Canadian Star Trek coins here. What do you think about the new Star Trek currency? Share your gold-pressed latinum thoughts in the comment section below!